JSS Medical College & Hospital, Mysore: This medical institution is in Mysore Karnataka-southern part of India. The college was established in the year 1984 and later affiliated with the Rajiv Gandhi University of Health and Sciences and after that, University of JSS, Mysore also came into existence. The university has been established under the section 3 of UGC act. The university provides education in all dimensions and the courses related to education to prospect applicants, further, university also provide affiliation to other institutions in the state. The college provides admission on the basis of NEET qualification to all applicants who are applying for admission in the year. At both level of the program (UG and PG), the institute only accepts admission by the NEET. Here the applicant score plays an important role in the admission in JSS Medical College. The medical college has good sources of facility for students in terms of medical and dental education as well as well-equipped labs for them to sharpen their skills in all department of education. The college is liable to provide best medical facility to the local people. The motto of the medical institution is “work is worship”. The students are supported in various phenomena’s like anti raging, student counselling, technical support and other issues that are faced by the student in the college and the applicant will also encounter many facilities like hostel, cafeterias, fully furnished classrooms, library, sports arena, hospital and medical facility, auditoriums and labs in all departments. The seats are available in the medical college is 150 in the undergraduate program and for the postgraduate, there are 139 seats are available for the applicant. Here the candidate can opt from more the 30 subjects in the post-graduation level. It is important for the applicant to be the citizen of the country and the applicants must have an aadhar card too. It will be verified that the candidate has passed their class 12th from the recognized board and the school from any part of the country. He or she has Passed class with the minimum of 50% marks in all subjects and only candidates from the science background with biology in class 12th are eligible. These are the eligibility criteria for the student. The total fee for the candidate of MBBS is RS 5,18,700. Here, the fees of the BDS candidate is around Rs. 5,00,000 and the minimum fees for the postgraduate program is Rs 6 lakhs. For more details, the applicant can go to the official website of the college. NEET stands for (National Eligibility Entrance Test), The basic function is to select students who want to pursue a medical and dental program in their life. It is important for the applicant to clear this examination with a brilliant percentile and rank to get the admission in any of the medical institutions in the country. Date of declaration of result. Admit card of the candidate. They also declare the merit and the cut off list. 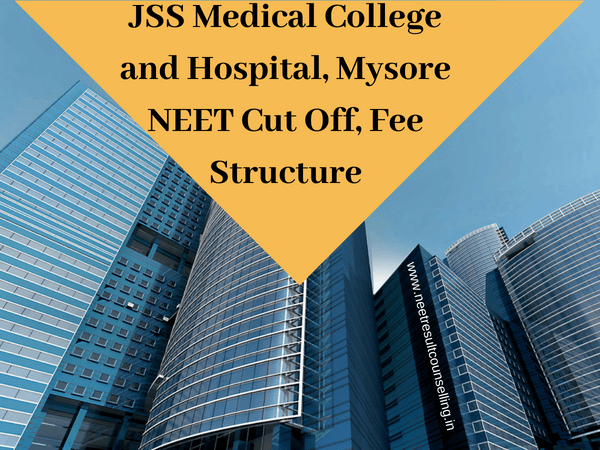 The admission in JSS MC is based on their performance in the NEET exam and it’s important for the student to perform well in the exam to get a seat in the counselling of JSS Medical College. There are no individual NEET criteria for this college, they take admission as per the state NEET criteria announcement also as shown above, minimum percentile and marks range are important to get qualify for the college. The student will get an ID and Password and it will be helpful for the candidate for the future use. Here, we would like to wish all students best of luck for the result of NEET examination, we hope every student gets a good score and get the best college of medical and dental in the country. Meanwhile, share this article with your interested friends and reply to us, if you got some queries. Sir, I am from Kolhapur Maharashtra. My daughter has given NEET exam this year. We are interested to appear in Mop up round MBBS of MCC . please let me know what is cut off marks after second round and How many seats are vacant for MBBS. My Daughter has got 180 marks out of 720. Sir Please let me know the chances of getting seat in MOP up round. The information will be useful while filling MOP up round MCC. I will be grateful to you.